World Scientific eBooks 2018 in Chemistry, Material Science, Nanotechnology and Nanoscience. Explore Library Search and your subject guide today and find out what else we now have available. As a University student it is imperative that you arm yourself against the barrage of fake news that can be found in today’s media. To produce academically sound assignments and research, you need to be able identify and evaluate information quickly and with authority. Be aware: just simply knowing that not all information is created equal is the first step. Check the source: Where did the information come from? This can be tricky, especially on social media. Read more: don’t just rely on the piece of information that’s in front of you… go an find another reliable source and see if the facts are the same. Check the author: Do a bit of Google stalking to see if the author is credible. Check the references: does the item have references? What sources have they used? Are they credible? Check the date: watch out for re-posts old news items. Check your biases: You own beliefs and prejudices can have an affect on how you accept information. Is it a joke? : If it sounds too good to be true, it probably is! Ask a Librarian: Librarians are the original Fake News Ninjas. Come and ask us about any reference that you aren’t too sure about and we can help you make an authoritative decision on the information you use for your research. Knowledge is power: Read more about Fake News and how you can win the fight. Everything you need to know is in our Fake News Guide. Read our other blogs on Fake News to be aware of the consequences of Fake News and the history and growth of Fake News. Fake News is nothing new and has been going on since time began! The term ‘Fake News’ is searched for in web browsers 70.8-118 thousand times a month. In 2017 Donald Trump mentioned the term ‘Fake News’ in public correspondence, 320 times! Read our other blogs on Fake News to be aware of the consequences of Fake News and how you can become a Fake News Ninja. Kiely, E. (2018) Trump’s Phony ‘Fake News’ Claims. Available at: https://www.factcheck.org/2018/01/trumps-phony-fake-news-claims/. Accessed: 23 March 2018). Smith, R. (2017) The Numbers Behind Fake News. Available at: http://www.dailyinfographic.com/numbers-behind-fake-news. (Accessed: 23 March 2018). Have you ever found yourself asking any of the questions below?…. Where can I find relevant, high quality information for my research? How can I track who has cited an article since it’s publication, as well as looking back on the references it used? How can I follow an academics work? Who can I collaborate with in my research? Which journal should I submit my paper to? Where can I find information to support my research funding application? …..If you have, then why not take a look at Scopus and use it as your starting point? You can access it through Library Search or through your subject guide in the ‘Journals and Databases’ section. Whatever subject you are studying, Scopus is one of the databases that you need to get to know. It is a large multi-disciplinary abstract and citation database of peer reviewed literature. It contains over 69 million records, including journal articles (from 22,000 titles), conference papers, books (20,000 new book details added every year) and book chapters. However, it doesn’t just have a list of results for you to wade through, but it has a series of smart tools which help you track and visualise the research as well. You can search for documents, sources, authors and institutions and compare and contrast them using a variety of different tools. If you are wondering if Scopus is for you, then check out the video below. And if you are already a user of Scopus, then why not listen to one of their webinars to get the best out of the resource or check out the Scopus blog for tips and tricks. Happy exploring! Fancy yourself as the next Sherlock? What comes into your head, when someone says ‘maps’? I think we often presume that if we aren’t studying geography, earth sciences, archaeology or architecture for instance then they aren’t for us. But think again! Maps can be applied to a variety of different ways in research and we have put together a Maps topic guide to explain what resources we have and potentially how they can be used. 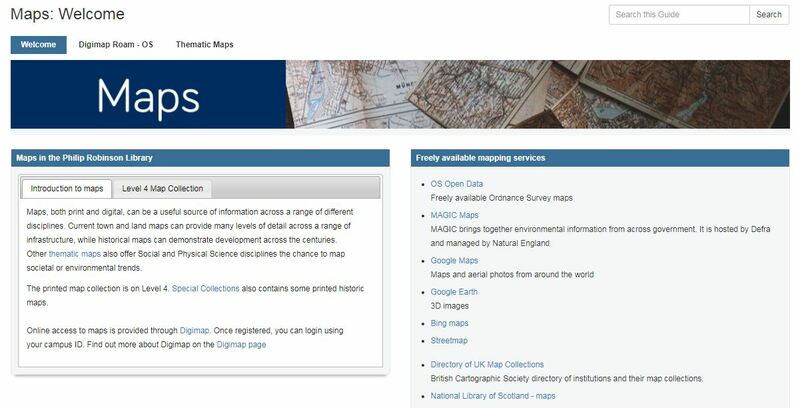 The Maps guide outlines the different ways you can access both physical and online maps and gives you an overview of how you can use our online Digimap ROAM subscription. With this tool, you can not only get up to date OS Maps, but also historic maps which can help track both infrastructure development, as well as social and environmental changes too. And if you want to directly compare different aged maps against each other, Digimap lets you toggle between the two on your screen. Designing housing in Byker for an Artists in Residence project. So…..before you rule out maps as not relevant for your research, why not take a minute and have a look at our Maps guide to see if there is potentially something for you! N.B. If you’re wanting to be the next Sherlock, just remember you need to plan your investigations in advance and register with Digimap at least 24 hours before you need to start using the resource. Posted on 28th February 2018 28th February 2018 Author Anne ArcherCategories Resources, Topic GuidesTags Agribusiness and Food Marketing, Agriculture, Archaeology, Architecture, Planning and Landscape, Biology and Zoology, Business, Civil Engineering, Combined Honours, Countryside Management and Rural Studies, Culture and Heritage, Earth Sciences and Geosciences, Education and Educational Psychology, Electrical and Electronic Engineering, Electrical Power Engineering NUIS, English Language and Linguistics, English Literature, Environmental Engineering, Environmental Science, Fine Art, Geography, Geomatics, History, Law, Marine Science, Marine Technology, Marine Technology NUIS, Mechanical Engineering, Mechanical Engineering NUIS, Media, Culture and Heritage, Music, Planning and Landscape, Politics, Renewable Energy, Sustainability, Transport Planning, Water ManagementLeave a comment on Fancy yourself as the next Sherlock? Taking a road trip and need to find this week’s petrol prices? Statistics…..legislation…..government bills….these often aren’t the type of things which get us jumping up and down with excitement and if we do need to find information on them it can be a bit daunting to know where to start. Where do I find statistics on this week’s petrol prices?….Where do I find historic proceedings of the Old Bailey? ……Where do I find out information on GDP growth? How can I find European or international case law?……What changes are forecast for the post-referendum UK economy?…… These are just the tip of the iceberg in terms of questions that can underpin vital academic research or help you with a business start up. But never fear, your trusty librarians are here with our Government Publication Guide. Hurrah I hear you shout! On the Government Publication Guide you will find a wealth of subscriptions and high quality links to statistical information, legislation, parliamentary publications and international statistics and official publications. So what are you waiting for…….head to the guide and check it out! Posted on 27th February 2018 27th February 2018 Author Anne ArcherCategories Resources, Topic GuidesTags Agribusiness and Food Marketing, Agriculture, Animal Science, Archaeology, Architecture, Planning and Landscape, Biology and Zoology, Biomedical Sciences, Business, Civil Engineering, Combined Honours, Countryside Management and Rural Studies, Cross Cultural Communication, Culture and Heritage, Earth Sciences and Geosciences, Education and Educational Psychology, Electrical and Electronic Engineering, English Language and Linguistics, English Literature, Environmental Engineering, Environmental Science, Geography, Geomatics, History, Joint Honours, Law, Marine Science, Marine Technology, Mathematics and Statistics, Mechanical Engineering, Media, Culture and Heritage, Medicine, Nutrition, Physics, Planning and Landscape, Politics, Psychology, Renewable Energy, Sociology, Speech and Language Sciences, Sport and exercise science, Sustainability, Transport Planning, Water ManagementLeave a comment on Taking a road trip and need to find this week’s petrol prices? The Library has trial access to the Kanopy film streaming platform. This provides access to over 30,000 films from 800 filmmakers. The content includes feature films from classics to contemporary, together with international documentaries on a wide range of subjects, including arts, business, history, science and technology, and politics. Kanopy’s functionality includes creating clips and playlists, viewing subtitles, and adding comments and ratings. The trial ends on March 18th 2018. Please explore and send us your feedback. NB If you are off-campus, please log in to RAS first of all, and then within RAS, access this blogpost and Kanopy link.